And pretend that an audience exists even though no one knows that I have a blog. My boss at work is pushing me to keep up on the New Media of Social Media; constantly sending me links and articles. One meme in particular is influencing this current post, and hopefully, the subsequent posts which follow. It involves a list of social media conventions which is currently being compiled across several blogs all of whom tag each other and interconnect. So of course I don’t have a link to tag to this list at the moment, but I’m sure I will attach one at a later time. Moving on, my attempt to embrace Social Media will be to post brief reviews of Old Media, meaning CDs, DVDs, music and cinema. So without further ado…. I read a review for this on Aint It Cool News and the reviewer did a good job of making me interested in renting this off Netflix. I ignored this on theatrical release despite the teaming of Jackie Chan and Jet Li because, let’s face it, they’re slightly past their prime and their best work, the trailer looked like a bad remake of TMNT 3, and I wasn’t convinced that the kid character wouldn’t be anything more than a Scrappy Doo. The movie would have to try its damned hardest to win me over. And despite the dodgy opening scenes that establish the kid character, once the movie finds its feet in China and explores the myth of the Monkey King, I started to warm up to the concept. And hey! It’s a time travel story. Sort of. It’s more of a fantasy, but whatever. The kid is not as annoying as I expected, Jackie Chan is charming and shows off Drunken Fist style, Jet Li as a buddha character and as the Monkey King regains some of the dignity he lost since he did Romeo Must Die, and the female leads are hot and are actually given some substance in their roles so they’re not just window dressing. I also really dug how the story incoporated Chinese mythology and its obvious love of and respect for previous traditional kung-fu movies. Also Rob Minkoff, working with Yuen Woo Ping (fight choreographer for The Matrix movies), really knows how to shoot a fight scene. Unlike most of today’s “action” movies which is too many close-ups and edits, the camera hangs back and lets us enjoy the rhythms and movements. And there are a lot of action scenes showing off various fighting forms so it’s never boring. Very smart. My favorite fight scene was the one between Jet Li and Jackie Chan as they engage in the classic, if cliched, two-heroes-fighting-because-of-an-initial-misunderstanding-before-teaming-up. 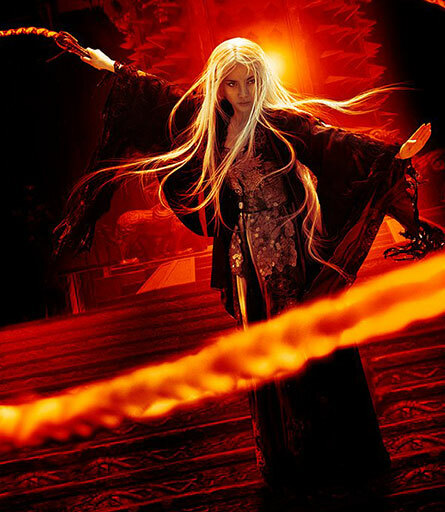 My favorite character was Li Bing Bing looking unbelievably hot and wicked in a white wig (surely referencing Brigitte Lin in The Bride With White Hair). And my favorite surprise was actually enjoying Jet Li’s dual performance as the Buddha and as Monkey King. He does such a good job of giving each character their own personality; his work as Monkey King reminded me so much of my favorite Shaw Brother Venom, Chiang Shiang. So watching this movie made me nostalgic for classic Shaw Brothers, and that’s a high compliment. By movie’s end I also felt connected to the characters and actually cared about their individual fates. And I dug the sweet and brief reunion of Golden Sparrow and Jason, with its hint of their continued connection. The disc’s special features do a good job of providing additional information that actually enhances the experience, especially the featurette on Monkey King and the Eight Immortals. So a perfect Saturday evening movie. Tomorrow I have The Small Back Room by Michael Powell, a WWII thriller. I’m looking forward to that.